lower production costs, and improve product performance. The deal spans development, demonstration and commercialization of Solidia’s carbon dioxide-based concrete curing method. A global gases and engineering company based in Munich, Linde will work with Solidia to demonstrate the feasibility of commercial-scale production of CO2-cured precast. “Linde will bring carbon dioxide supply and delivery expertise including engineering of application-specific equipment. This project marks an important step in proving and enhancing our CO2 management capabilities,” says Linde’s Dr. Andreas Opfermann, head of Clean Energy and Innovation Management. The two companies will also collaborate to market the technology as a new solution for precast producers. Cement production is responsible for 3–5 percent of net carbon emissions, and global demand for concrete products is second only to the demand for water, Solidia officials note, adding that powder producers have committed to reducing their carbon footprint but are often constrained by assets and chemistry. By helping develop a means of transforming CO2 into a valuable commodity for one of the world’s largest industries, the Solidia-Linde agreement will help speed the market and social impact, recategorizing CO2 as a catalyst for profitability and growth. The company’s concrete curing technology utilizes Solidia Cement, milled with a novel chemistry that yields finished binder embodying lower CO2 emissions than conventional portland cement production. 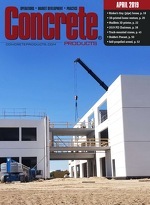 The use of Solidia Cement and companion CO2-based curing methods can lower the total carbon factor in precast concrete by 70 percent as measured against portland cement alternatives. Solidia also points to faster curing times with its technology, plus lower energy consumption, production water and labor requirements. The Linde collaboration adds to a robust roster of collaborative testing agreements and third-party research that reinforces Solidia’s technology and product development, among them: an ongoing precast product-centered project with Lafarge Group; a Cooperative Research and Development Agreement with the Federal Highway Administration to examine transportation infrastructure applications at the Turner-Fairbank Highway Research Center; and, a four-year research & development project under the Department of Energy/National Energy Technology Laboratory’s CO2 Storage Program. Long-term research continues at Rutgers, the State University of New Jersey, where the original generation of the Solidia binder and curing technology was developed.